The critical reaction to Iron Fist season 2 is in. 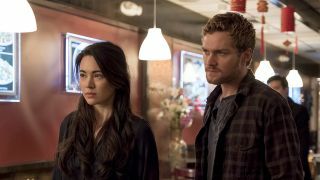 If, like me, you weren’t a fan of Iron Fist season 1, you probably have some fairly low expectations heading into Danny Rand’s second go-around on Netflix. But there’s always hope, right? People learn from their mistakes and, while the issues in the first six episodes of the sophomore run are still there, things appear to have gotten a little better, at least. Mild spoilers to follow. “If you are transfixed by Ward Meachum’s manpain, season 2 will speak to you. And if season 1 left you clamoring for more, more, more! of Davos, then get ready to buy a lottery ticket, because this Friday (when all 10 episodes release on Netflix) is your lucky day. “If this season’s boring plot, uninteresting villains and absurd characterization aren’t enough, it’ll come as no surprise that the pacing is equally problematic. While recent seasons of Marvel’s TV series haven’t fallen prey to a bloated episode count, Iron Fist season 2 shows all of the telltale signs. “Viewers will no longer be left to guess precisely what, if anything, Danny Rand (Finn Jones) — the bearer of the “Immortal Iron Fist” mantle and supposedly the greatest fighter who ever lived — is doing on screen. Metzner and first episode director David Dobkin (Into the Badlands) make sure of this in the very first scene, in which Danny confronts a gang of gun-wielding, knife-throwing thugs after they murder three security guards in order to steal an armored truck. “And now we get to the second season of Iron Fist. Though his character is still whiny, Danny’s more likable. But I don’t get to see that much of playful Danny, which is what I liked so much about him in The Defenders and Luke Cage. When Jones plays serious Danny, which is most of the time, I don’t buy it. It helps, though, that he’s dating and living with Colleen. She helps balance him, while being her own person. For more binge material at the click of a button, check out the best shows on Netflix.